Meanwhile I have got behind with Humument pages. Here is the most recent. It will appear in my exhibition later in the month at Flowers New York but has been done in time to mark the show that opens next week at the Keiller Library of SNGMA Edinburgh. 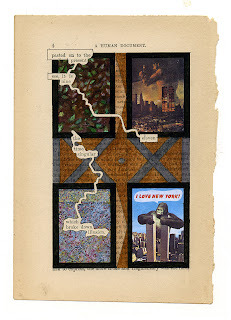 A Humument can serve as a book of reptrospective prophecy. When reworking p4 I was taken aback by finding 'nine eleven' emerging from Mallock’s 19th century text. I have joined this to two images from A Postcard Century that were indeed prophetic, featuring as they do the towers being attacked by Saturn and King Kong. One of the things I enjoy most is the 'only connect' aspect of linking one work of mine to another, so that all projects can be seen as parts of a single enterprise. and there's that word again...meanwhile. Once again, a piece designed to provide plenty of inspiration and thought.